May 30, 2018 Bulk Packings, Columns, Referenced ArticlesSMT Inc.
May 24, 2018 Bulk Packings, NewsSMT Inc.
July 14, 2017 Bulk Packings, ColumnsSMT Inc.
Did You Know You Can Purchase SMT Chromatography Products on amazon.com? Click here to start shopping for SMT HPLC Columns and Bulk Packing Resins on Amazon today! April 7, 2017 Bulk PackingsSMT Inc.
SMT MetalSep Resin is offered as bulk packing materials for low pressure liquid chromatography, solid phase extraction, preparatory and process scale applications. The packings consist of proprietary strong cation exchange functional ligands that are chemically attached on silica substrate using Total Coverage technology. Total Coverage technology utilizes advanced Self-Assembled Monolayers (SAM) to achieve bonded phase coverages that approach 100%. 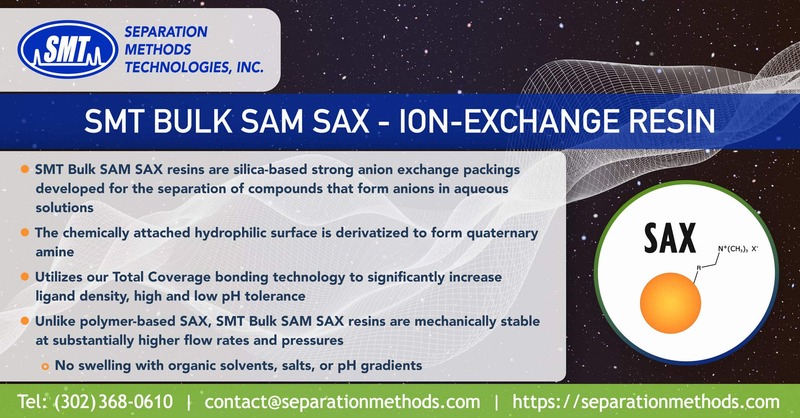 Our method of bonding allows the density of the functional ligands to be controlled with appropriate spacer molecules, a procedure that ensures highly cross-linked polysiloxane under layer structure. The results are bonded phases that are well protected and that show unprecedented resistance to both acid and base hydrolysis. The packing materials offer strong selectivities toward heavy metal ions such as Copper, gold, nickel, silver, iron, etc.